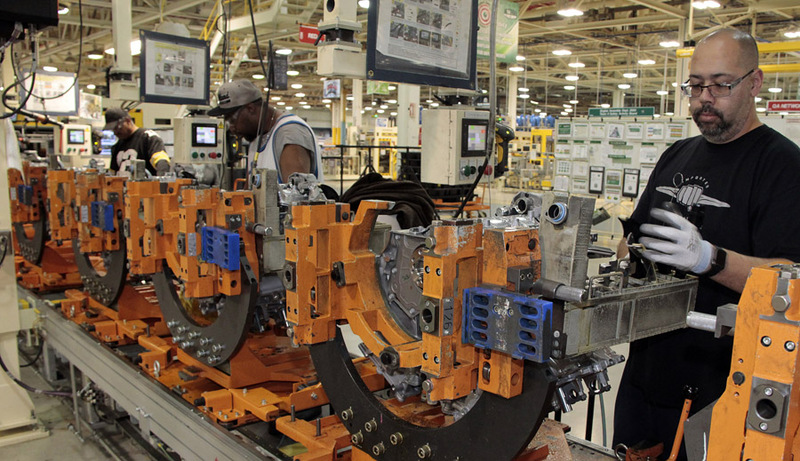 Fiat Chrysler Automobiles (FCA) made a big investment in its Mack Avenue Engine Plant in Detroit several years ago in terms of money and quality management, and it has paid off. The plant was awarded World Class Manufacturing’s (WCM) silver designation in December 2017; an upgrade from a bronze designation the plant was awarded a short 15 months prior. “We call that our game-changing moment,” says Tyree Minner, plant manager of the Mack Avenue plant. FCA announced in 2012 that it was investing nearly $200 million in upgrades to the facility. 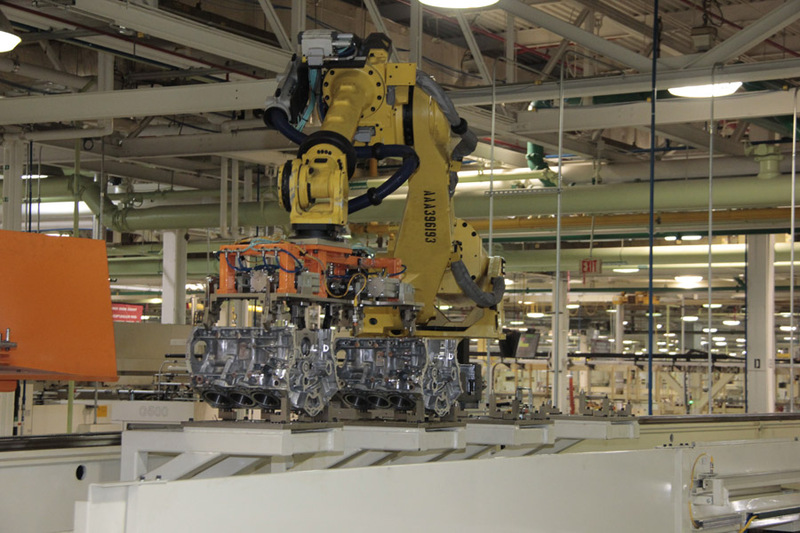 Retooling began in 2013 and production of the Pentastar engine at the facility began in 2014. Today, the fine-tuned manufacturing processes that are the hallmark of the WCM method are part of what allows the plant to churn out roughly 1,000 Pentastar V-6 engines daily. The Pentastar engine name serves as a nod to the former Chrysler Corp. trademark and was initially introduced in 2009 at the New York Auto Show. 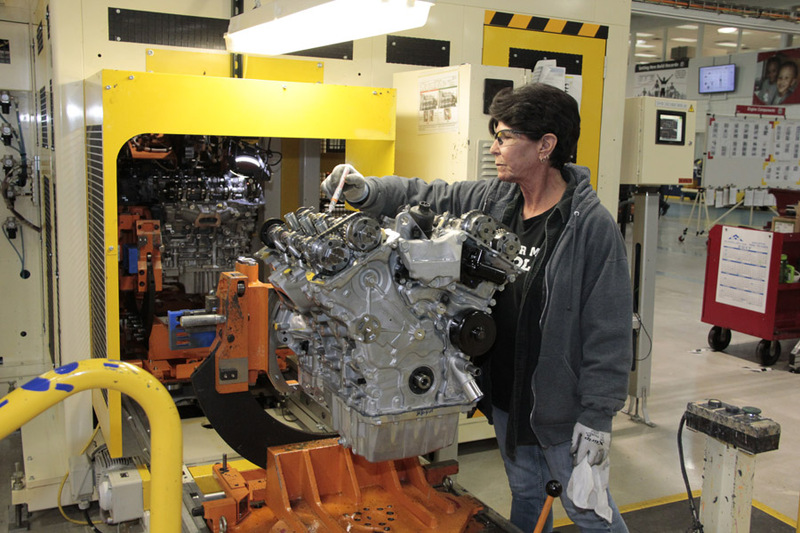 FCA employees assemble Pentastar V-6 engines, which are placed in a number of Dodge and Chrysler models. Workstation efficiency is closely monitored as part of the WCM process. WCM is a manufacturing methodology, a concept developed by Fiat and partnering companies in 2005, that focuses on eliminating waste, increasing productivity, and improving quality and safety in a systematic and organized way. While fully embraced by FCA in all its facilities, WCM is not exclusive to the company or the automobile industry. The mastermind behind WCM is Hajime Yamashina, professor emeritus at Kyoto University in Japan. He created the “10 technical pillars” of WCM, which include a focus on safety (occupational safety), cost deployment (distribution of costs), focused improvement, autonomous activities, professional maintenance, quality control, logistics, early equipment management, people development and environment. According to Tinson, in 2006, before Fiat and Chrysler joined forces, Fiat implemented the WCM process at associated business units, which today include Comau, Teksid, Magneti Marelli and Fiat Powertrain Technologies. WCM Academy, based in Michigan, was established in 2012 as a place where FCA North American employees can learn about the WCM methodology and collaborate to seek out the best methods to improve their plants’ processes. In 2012, the first gold award (more on the awards later) was earned by the Bielsko-Biala engine plant. A robot delivers engine blocks for a machining operation. All robot movements are audited for effectiveness in the WCM process. To determine how a facility is performing, the WCM method includes an audit system based on a total of 100 possible points. Improvements are measured in the performance of the 10 technical and 10 managerial pillars. To offer an objective viewpoint, trained auditors from other facilities that are also WCM members observe the production site and do comparisons to establish best practices. They determine if the correct application of the WCM methodology is taking place and tally the points. Tinson says they keep “raising the bar” so the processes at each of the FCA plants continue to improve. When the WCM method was first implemented in the Mack Avenue plant, Tinson says they were focused on the low-hanging fruit, which would be the problems and issues that have the most impact on operations as determined through cost deployment. For example, Tinson says the process of improvement includes looking at each and every workstation, assessing what work goes on there and determining what other methods could be used that would result in more efficient processes. Minner adds that when he stepped into his role in 2015, the overall line effectiveness was in the low 80 percent area. Tinson says the WCM philosophy isn’t a “top down” process. Rather, “the operator is king,” she says, because they are the ones that have the first-hand knowledge of what’s going on in their workstation. Minner echoes that sentiment, saying some of the most valuable information they receive to improve their approach to WCM comes from the shop floor operators, and they are rewarded for their recommendations. The empowerment also enriches the employees’ work experience. Minner says the employees not only appreciate this level of engagement, “they latch on to it,” and it helps to form a tighter workplace community. Suggestions from employees also help to reduce costs. Those savings are put back into operations. An employee loads a crank for a Pentastar V-6 engine onto the assembly line. Part of reaching that concept zero goal is to have industry-leading technology, all of which is WCM approved. To that end, a new assembly line was brought in to the Mack Avenue facility when the Pentastar V-6 engine became its focus. They produce a 3 liter, 3.2 liter and 3.6 liter for a variety of vehicles, including the Jeep Cherokee, Dodge Grand Caravan, Dodge Journey and three vehicles exported to China. 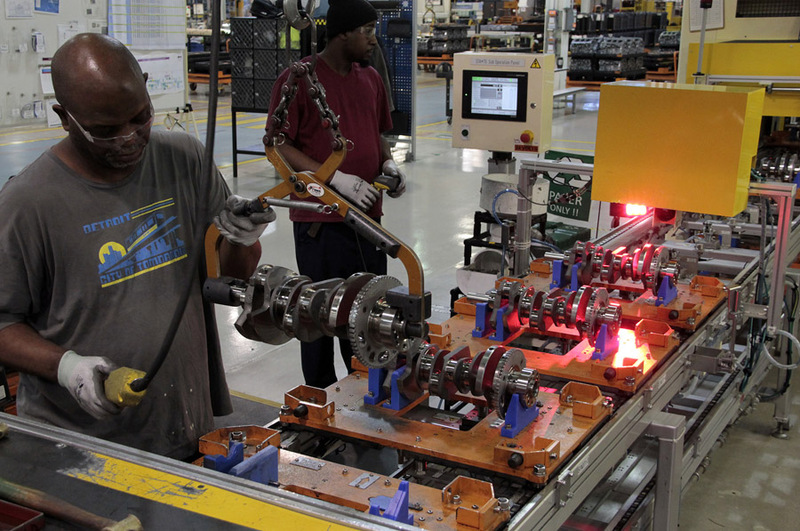 The Mack Avenue plant is fully automated. Milling and drilling are the only metalworking processes involved, and the machines dedicated to those tasks are automated. Material handling is also automated with conveyors and robots doing all the heavy lifting. However, approximately 750 people perform final assembly of the engines. Minner says the team at Mack Avenue studies all robotic movements for efficiency. But the concept zero aspect also involves machine availability and part quality. They’ve also worked out a way to maintain part quality without shutting down machines to do so. Tinson says the Mack Avenue facility is also equipped with part delivery systems that efficiently bring parts directly to operators. This is another process that is continually monitored to make sure the part is dropped off in a way that makes the operator as efficient as possible. These findings aren’t kept secret – she says they are passed on to other FCA plants that can gain from that knowledge. Furthermore, the efficiencies gained in WCM organizations in other industries are also shared, which is one of the benefits of being a WCM member. Tinson says there is no competition between facilities because only one organization from a specific industry is allowed to become a WCM member. For example, Royal Mail, which is the United Kingdom’s mail service, is a WCM member. Members of the FCA manufacturing organization visit Royal Mail facilities to study how they’ve addressed various issues, and they’ve gained advice from Royal Mail officials, and vice versa.